Days after the Texas Board of Education voted to amend the state's social studies curriculum in order to correct a perceived liberal bias, a Texas chapter in Japanese American history comes to mind. According to press accounts, among the changes the school board made to the curriculum is "an amendment stressing that Germans and Italians as well as Japanese were interned in the United States during World War II, to counter the idea that the internment of Japanese was motivated by racism." An internment camp in the south Texas town of Crystal City did hold German and Japanese internees, as well as prisoners deported from Latin America and a half-dozen Italians. 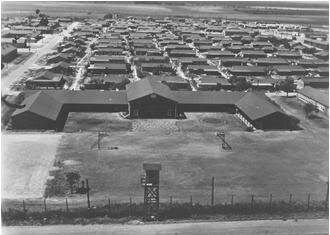 Other internment camps across the country held a mix of foreign nationals. But the fact that the U.S. government interned European immigrants in no way negates the racism that led to the mass incarceration of Japanese Americans.